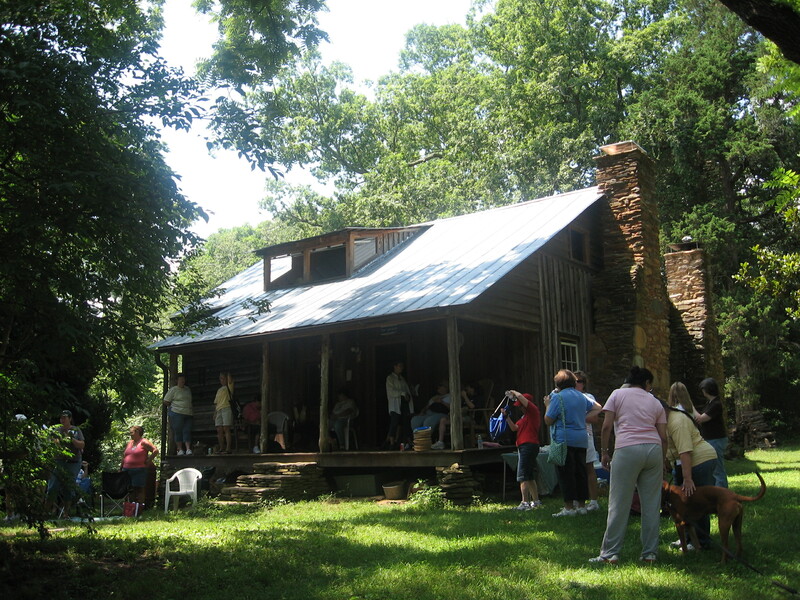 Visitors at the circa 1843 Power Cabin, one of the rare examples of a single-pen (one room) log house remaining in Cobb County. Although a framed addition was added later, the original hand-hewn, squared-and-notched log construction is still visible. Cobb County, Georgia, (population 607, 751) was carved out of Cherokee lands in 1832. Cobb County included many small subsistence farms rather than many large plantations. Marietta, being centrally located, became the county seat in 1834. Other towns established include Springville (later Powder Springs, 1838), Acworth (1860), Big Shanty (later Kennesaw, 1887), Smyrna (1872), and Austell (1885). The construction of the railroad in 1845 contributed to the growth of the county. Cobb County was the site of significant activity during the Civil War, including the Battle of Kennesaw Mountain, now commemorated by a National Battlefield Park, and the occupation and burning of Marietta. During the years after the Civil War, agriculture remained strong in Cobb County. By 1940, farming was declining, and the economic base evolved from primarily agricultural to industrial. In 1942, the federal government built a factory in Marietta, where the Bell Aircraft Corporation produced bombers during World War II. By 1945, the assembly plant provided employment for more than 28,000 workers. Although the plant closed after the war, it was reopened in 1951 during the Korean War. Lockheed Aircraft Corporation continues aircraft production there today. The Cobb County Historic Preservation Commission, in partnership with tourism and historical organizations, has produced a historic driving tour brochure. “Driving Through History” was funded in part through a Historic Preservation Fund grant, matched by several local organizations. The brochure details three possible driving tours, each allowing the individual to experience the wide variety of historic resources in Cobb County. Cobb County was the first county in Georgia to create a historic preservation ordinance that entirely covered the unincorporated portions of the county. As of 2009, there are 21 individual historic landmarks and two historic districts in the unincorporated portion of Cobb County. The Cobb Landmarks and Historical Society conducts an annual heritage education workshop called “Talking Walls” for teachers and other educators. Participants learn how to incorporate local historic resources into the existing curriculum and the classroom using historic maps, photographs, and documents.